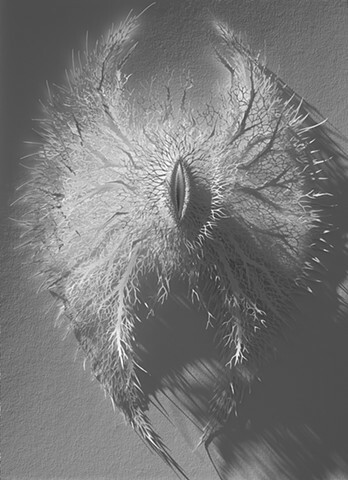 This work plays with the nature of the sacred and profane: on the surface it appears to resemble a simple, delicate flower-like organism but observe more closely and we can perhaps see a more voluptuous reference to the human sexual organs. Nature of course it filled with sexuality, it is after all a vast machine of reproduction, of feeding and breeding. We tend to efface this aspect of nature in our attempt to sentimentalize it. I was inspired to create this piece after learning that in the 18th century young ladies were forbidden from looking at books of botanical illustrations because the explicit sexuality of the plants reproductive organs was seen as pornographic.